Today i'm gonna share the first of a brand new programming design pattern series i made. The builder pattern is a very useful and common pattern while developing serious apps. In this post i'll give a tiny builder pattern framework, so you can always come back here and get it to work with. A mnemonic, while dealing with builder pattern, is to think about customization. I always think about it, when i'm figuring out if i should use it or if i better take a factory. That's the way it works better for me. try yourself. Here is how the little framework looks like. Simple, nice and straightforward. The code is also very simple, small, clean and self-explanatory. I like to code expressive, so i don't need to comment a lot. In this sample here i did, because it has a tutorial character. While developing i created some convention to my self. I think it is very important to do so. It is like applying the right grammar on a language while developing. For example: If i'm using the Builder Pattern, i always put the suffix Builder at the end. Well you may say or think now: what? But thats in fact a very, very, important info for beginners and expirienced developers. They will automatically see the idea behind it and will try not to break the pattern. In fact expirienced developers will love it and try to continue a good work, because they know, that the developer who wrote this, knows what he did and for sure there was a reason for it. // WHICH BUILDS AND RETURNS THE FINAL PRODUCT "T"
The parts in our example are the ingredients. Let's implement some ingredients to use it later to make a cake. // 1. EXAMPLE: PART TO CUSTOMIZATE "INGREDIENTS"
This is the Recipe in our example. 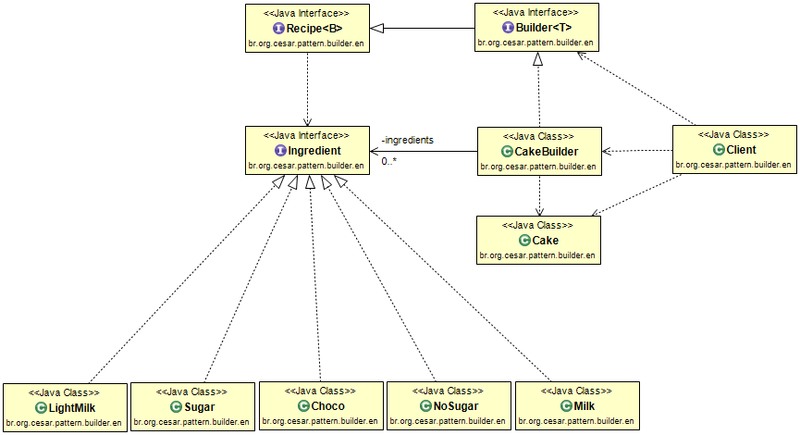 // ADD A LOT OF PARTS BEFORE I CALL "BUILD()"
In our example the product to build is a cake. and 1 source from my teacher at the university. I tried to cut the implementations together. I'd like to have a constructive conversation about the pattern, because it seems to me, that this implementation is not explicitly for the pattern. Am I missing something? It seems to me, that the products are really strict about what can a product do. In theory the point of the pattern would be to hide any detail about the ingredients. If I want a chocoMuffin, I don't have to explicitly tell what it is from. explicitly tells, what are the details. Also setting the calories are inconsistent with the printCalories();. printCalories doesn't take it count the incoming calory values. Ideally the build should come from the generic builder. That should know what are possible ingredients and know only that. It's not clear to me, where is the director class.